Now I'm back wearing glasses, they're kind of replacing handbags in my life. In that, I've gone all Pru Leith & want a pair in every colour and if possible, a few designer ones too! Of course, just like designer handbags, I can only look and wish. Glasses are expensive. 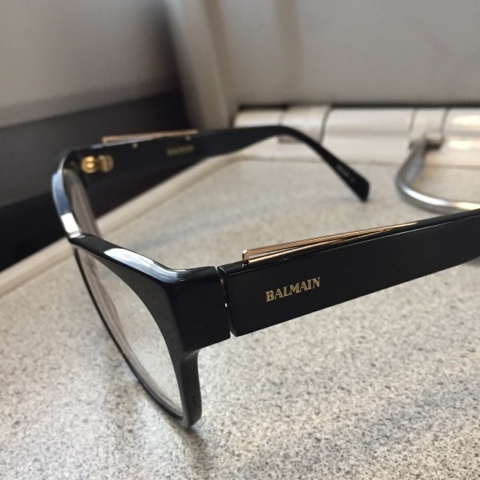 But last week, Christmas come early when David, the main man in Specsavers Victoria Square, invited me in to the store to check out the new Balmain collaboration AND offered me my choice of frames as a gift. Balmain is a real old school French fashion house - remember Pierre Balmain? It's one of those brands I remember from my childhood. My mum must have had a perfume by them. The brand was close to bankruptcy before 25 year old Oliver Rousteing, only a year with the company, was promoted to the role of Creative Director. He has an amazing back story and with his appreciation of the power of celebrity and social media, he has catapulted Balmain into the 21st century. You can read a little about his impact on the brand in this GQ article. Part of his plan has been strategic collaborations with the likes of H&M and L'Oreal - bringing Balmain to the masses. And the latest hook up is with Specsavers in the form of a range of frame designs that are both fashion forward and a nod to classic French style. I tried on all of the styles that were available. Despite the range only launching that day, already one of the pairs had sold out! 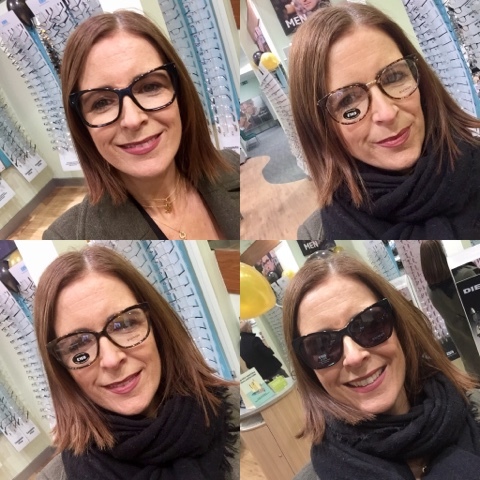 Jennifer in the store was so helpful and once she got the feel for what I wanted, she immediately pulled the prescription sunglasses from the lower right hand image above, popped out the lenses and it was an immediate yes! 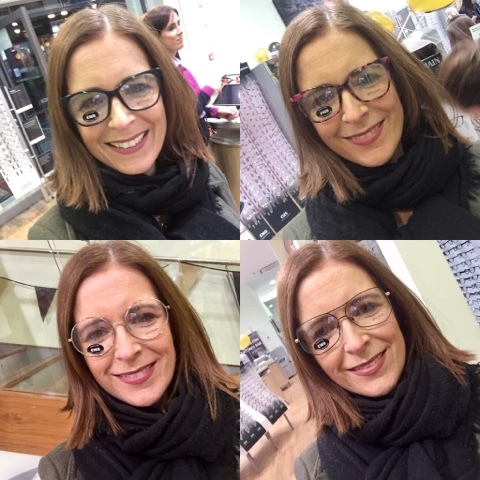 Because all of the range can be made with a clear or tinted lens and with the 2 pairs for £169 offer, it means you can even opt to get one of each. After a quick measure of my eyes & pupil distance, I was told that my frame was in stock and that if I came back in an hour, I could wear home my glasses. That's what I call service. Obviously, when you're in Victoria Square, you're in the right place to kill an hour so I headed to House of Fraser to mull over that jumpsuit from my party outfit post last week. And just over 2 hours from when I arrived into the store first, I bounced out of Specsavers with my little bit of Balmain. I should say that I didn't need an eye test as I'd just had one with my own optician, Gillian, so this made the process even faster. Obviously this is something that Specsavers offer too and it usually requires booking and an additional half hour or so. But I guess what I realised from this is that there's nothing stopping you buying a pair of glasses elsewhere while staying loyal to your existing opticians. 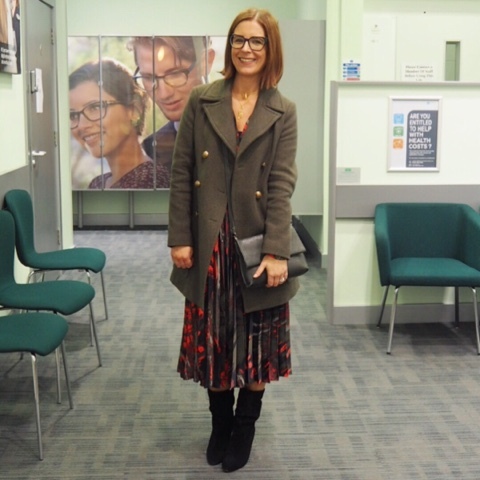 While I love my 'good' glasses I got from Gillian and love supporting an independent optician, it's nice to have a pair or two of high street glasses to mix and match. You can ask your opticians for your prescription and bring it with you anywhere (provided it's in date). Thank you to David, Jennifer and the rest of the team at Specsavers in Victoria Square for looking after me so well. I was gifted my frames & single vision lenses but I wasn't paid to come in or to write this blog post. All the words are my own. Thank you for supporting the brands that support this blog.